Got a great weather window and just in time to head to the Marathon Hump. Three of us load up and go looking for pilchards. 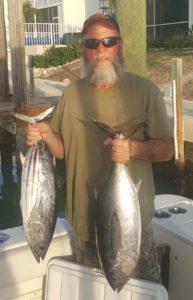 They were very scattered, but we got enough to fish with on the hump and reef. Cleaned up the mess and headed south. It was a nice boat ride and there was several already there as it was a flat calm day. We started with the troll and with-in about 15-20 min the drag is screaming. Ron jumps on the reel as we leave it in the rod holder to help us get it in the boat before the sharks get it. This one was giving the first-time saltwater angler all he wanted. We were yelling to get it in before the sharks showed up but it was putting up a tough battle. He even had two hands on the crank until we put it in low gear. He is cranking and gaining so we put back in high. Ready with the gaff at boat side and first BFT is a nice 24lber. That work out well so we put the spread out again. It took a couple circuits around the hump but we get another knock down. Drag starts off screaming but then is coming in a little easier than the last one. Still a good fight for the first timer. 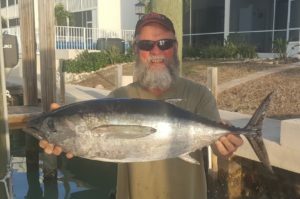 We are thinking smaller BFT or skippy but as he is cranking it towards the boat as fast as he can we see that it is a wahoo. We have gaff in hand but the fish was still green and as he stopped cranking the fish went crazy right at the boat. We tried to gaff but on the second jump it spit the tuna lure. Kinda in shock, we stood there looking in the water as our rookie is not aware of how big of loss that was. Regroup, put the spread back out and make some more circuits. This was a strange day, no birds, no bait busting, not even the guys chumming with live pilchards seemed to be hooking up. We finally get another knock down after a couple of laps and we put the rookie back on the rod. This one puts up a good fight but we have no problems getting the skippy in the boat. We now have been trolling for 2 hours with little action and with the sun getting higher we switch to drifting. Start out with a couple livies down 200 – 350 feet and also drop a couple of jigs as we cruise at 3 knts. Make several drifts with only one solid bite up and it pulled the hook right at the boat. We only saw one small BFT caught by other boats as we drifted. The best part was seeing, an aircraft carrier come by the hump. Planes taking off and landing it was sick. With nobody interested in our pilchards at the humps we decide to hit the reef and see what kind of species are hungry. Get to 120’ and drift over the Thunderbolt a couple times. Very slow there, so we anchor up on a nice drop off. I have caught some sharks and goliath groupers on this spot. Want to send the rookie back with a big fish story. Set out a freeline livie, live bait on the bottom, chicken rig and even some dead sardines on the bottom. Chummed with live pilchards, chum and dead sardines. We worked this area hard, but the bite was slow. He did manage to catch: several small YTs, 2 rock hinds, grunts, and a small grouper. Nothing huge but it was a nice variety of fish. Weather was beautiful, seas were calm, and it was a great day on the water.